In Singapore most of the major malls have a Breadtalk bakery outlet selling a variety of breads and pastries some of which can be very different from the types found in the UK. I’m a person who is extremely partial to a good all day breakfast and one of the stranger products offered that caught my eye is something called Rise and Shine. This delight consists of a thick slice of bread, cheese, ham and a well cooked egg on top. I presume that this is meant from breakfast but it's usually found throughout the day in most outlets. The initial thought of eating a cold fried egg was off-putting but don’t knock until you have tried it and these are great to eat any time of the day. For the past 4 years I’ve been a regular commuter between KL and Singapore and must have spent countless hours and dollars on flights and long distances buses between these two locations. A few people have asked me what it’s like to like to travel the 330+ km on a weekly or even twice weekly basis. 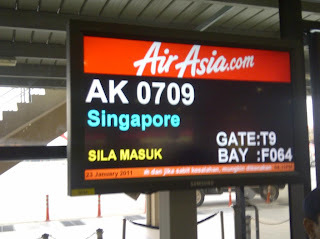 Last Sunday I took AK709 from KL to Singapore and I thought I’d record some of the trip details and show you what a typical journey is like. Owing to my haphazard travel planning the ticket was purchased around 24 hours before the flight at a cost of MYR283 which included a hot seat for extra leg room. No luggage option was needed due to myself only having hand luggage. A taxi was booked to pick me up at 15:00 and as usual they arrived a little early. The journey from Wangsa Maju to KLIA/LCCT usually takes around 50-55 mins however owing to the rather poor mechanical condition of the taxi (Proton Wira) that started shaking if the driver exceeded 88 km/h the journey took a little longer than usual. For many foreigners their first experience of a Proton is when they travel in a taxi and I’m sure that they are mentally scared for life with an image of a dirty, noisy, uncomfortable car with questionable maintenance forever ingrained on them. 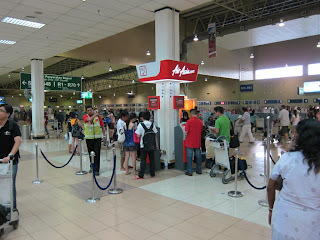 We arrived at the LCCT at 16:01 and the taxi cost was MYR 80 inc toll which is about normal. 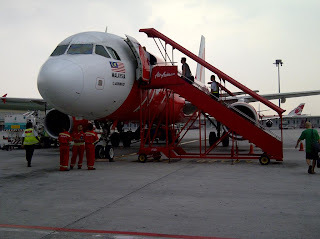 Another much cheaper option is to take the LRT and then the shuttle bus from the KL Sentral however it adds a considerable amount of time and pretty much removes the upside of the quicker travel time that flying provides. 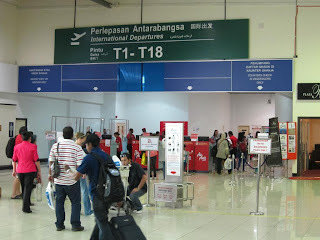 The LCCT is basically a large cargo hanger type of building containing rather basic and basic industrial style fixtures. 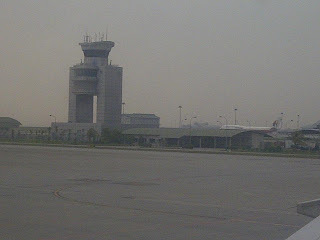 Owing to the popularity of the budget airlines the terminal was way over capacity and an extension was added to ease the pressure on the terminal. The extension has helped somewhat but I find the place more akin to a bus station than an airport and its the complete opposite to the relaxing ambiance and fantastic architecture of the main terminal. 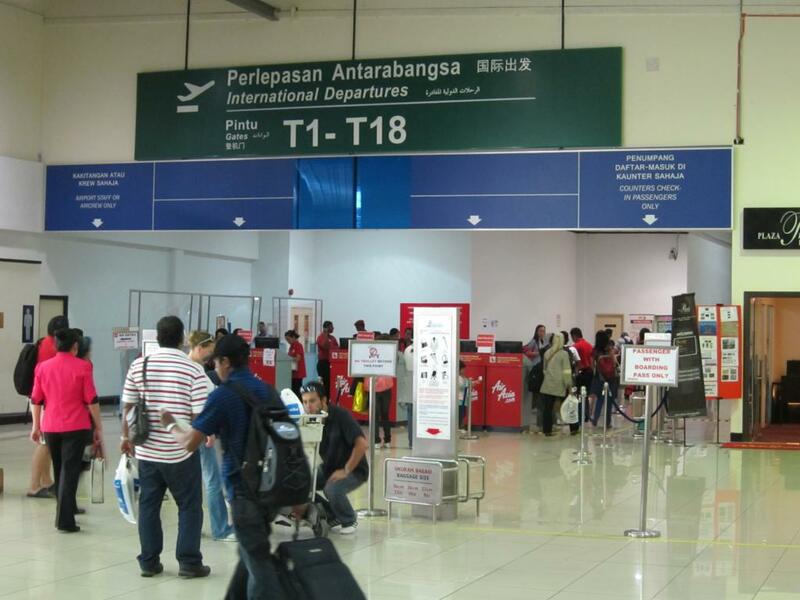 The LCCT is only a few hundred meters away from the main terminal however owing to the road layout a terminal transfer entails a 20km drive. As per the local press some plans are being discussed to look at other options which may involve transiting people airside. 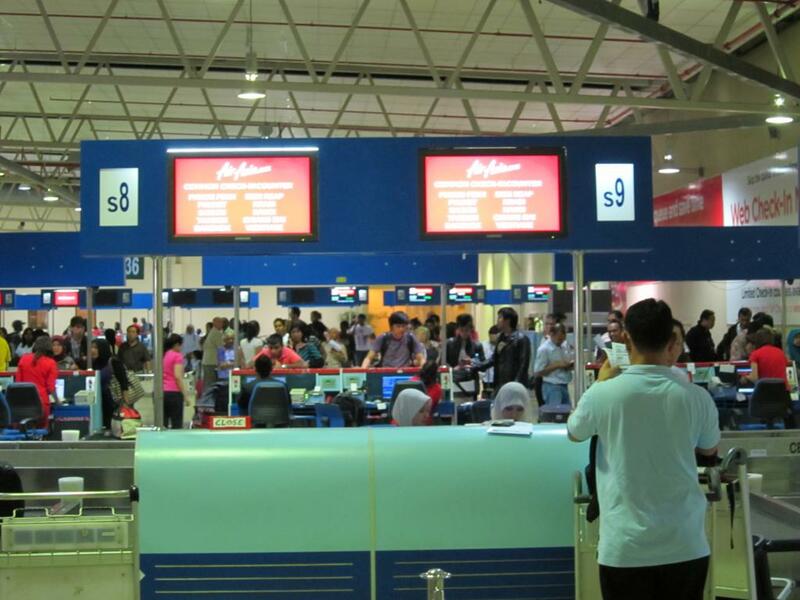 For Singapore flights the check in boards will always display Kiosk for the checkin counter due to the airline wanting you to use the self serve or web check in facilities. 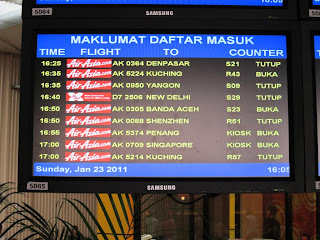 Air Asia now allow people to book tickets up to 4 hours before departure however owing to credit card processing times any tickets booked within 48 hours are prohibited from using the web or self serv check in counters. For the inexperienced traveller this can be confusing and I'm sure that many people must wonder round looking for counter ‘kiosk’. 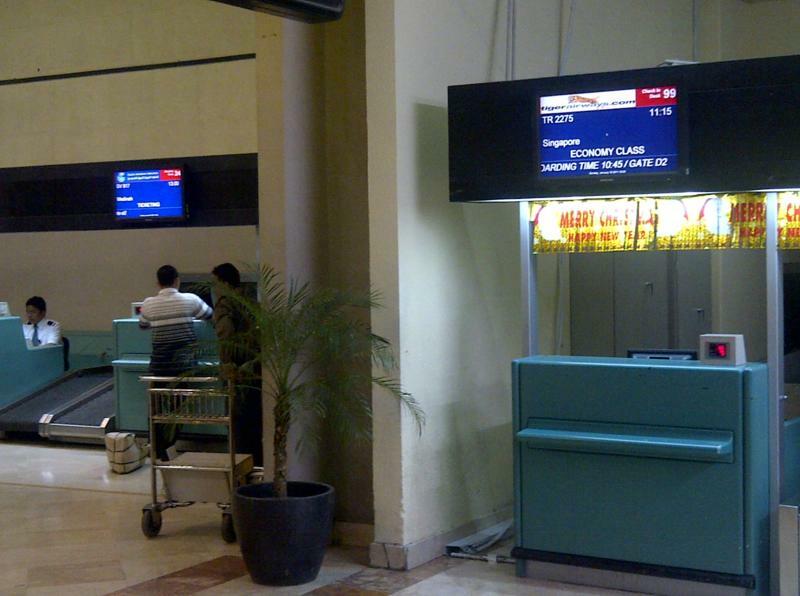 As a regular I usually give the board a cursory glance and head to counters S8/9 for check in. These counters are used mainly for the flights to Thailand and most of the time I’ve been lucky not to encounter significant queues. 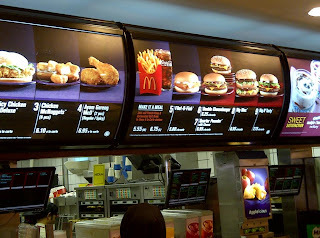 Check in was swift and completed by 16:07 so with my stomach yelling lapar lapar (very hungry) it was time to grab a quick snack at McDonalds. 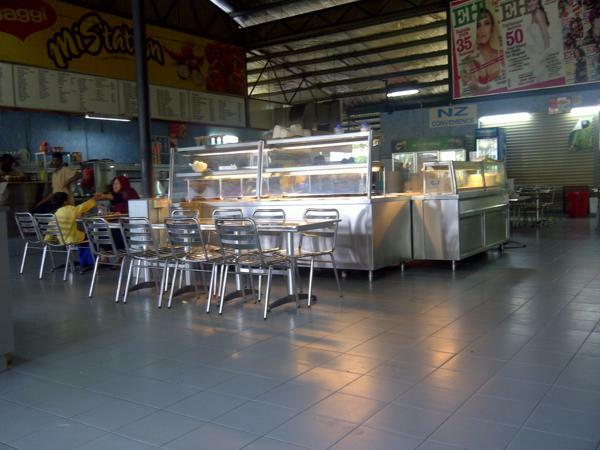 The restaurant was it usual busy self and full of people buying the bare minimum food or drinks so that they can sit there for hours playing on their laptops or reading a book. As a solo traveller it really winds me up when I can’t easily get a seat because of all the people facebook’ing, talking or even sleeping! 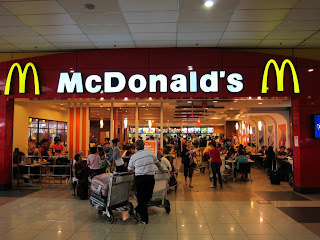 As with the main terminal the food costs more than that found of the majority of McD’s outlets and they sneakily try and hide it my changing the menu format and listing the price of just the burger and the fries/drink as an add on to make seem cheaper rather than just displaying the total price. Food was completed by 16:24 and it was time to walk round to the immigration counters. 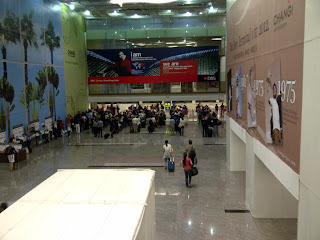 Despite there being only a few counters open the immigration and security formalities were completed swiftly. The now extended LCCT is now much better then when it opened and a few shops and food outlets have been added just after security prior to descending to the gate level. As I was collecting my bags from the xray machine the first call boarding was made at 16:32. 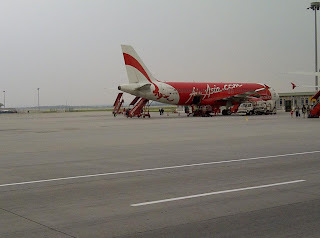 Air Asia customers who purchase hot seats are also entitled to priority boarding so to ensure that I didn’t miss out on this I rushed to the gate hence the lack of photos of the gate area. Fortunately today there were no delays and after a minute or two we were allowed to start walking to Gate F62 to board the aircraft. Air Asia run an extremely efficient turn around operation and today was no exception. 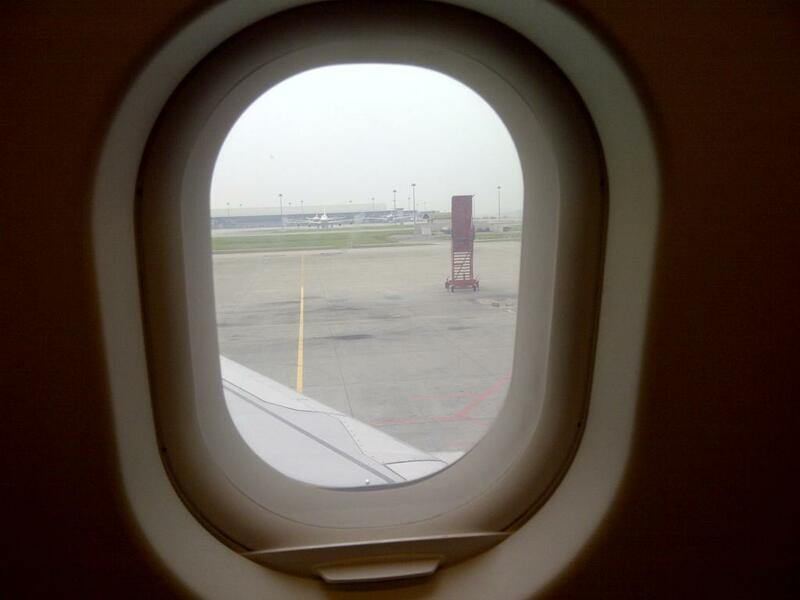 I noticed that the last of the arriving passengers were still disembarking from the aircraft as I walking to the gate and upon boarding the crew were still wiping clean the last few seats. 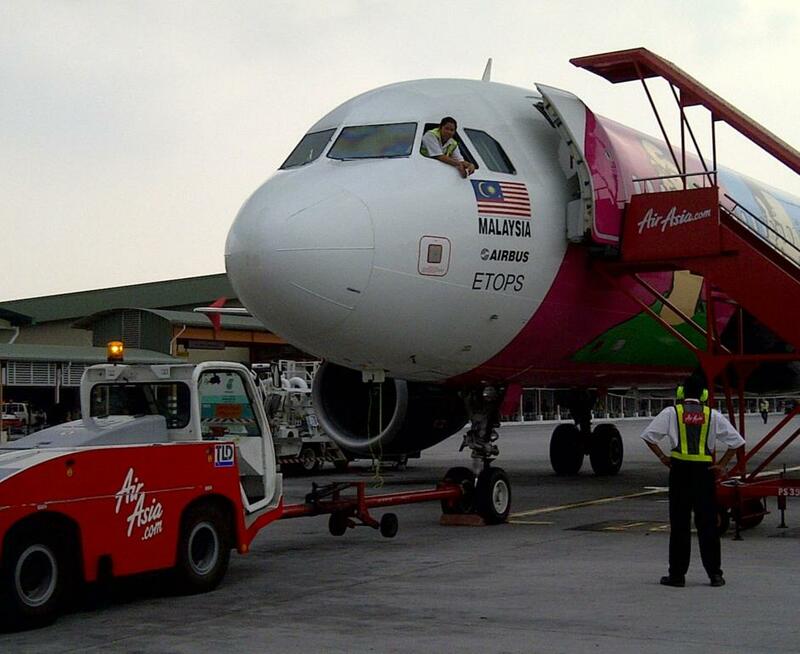 None of the gates at the LCCT have aero bridges so a walk in the heat and noise is needed to reach your aircraft. 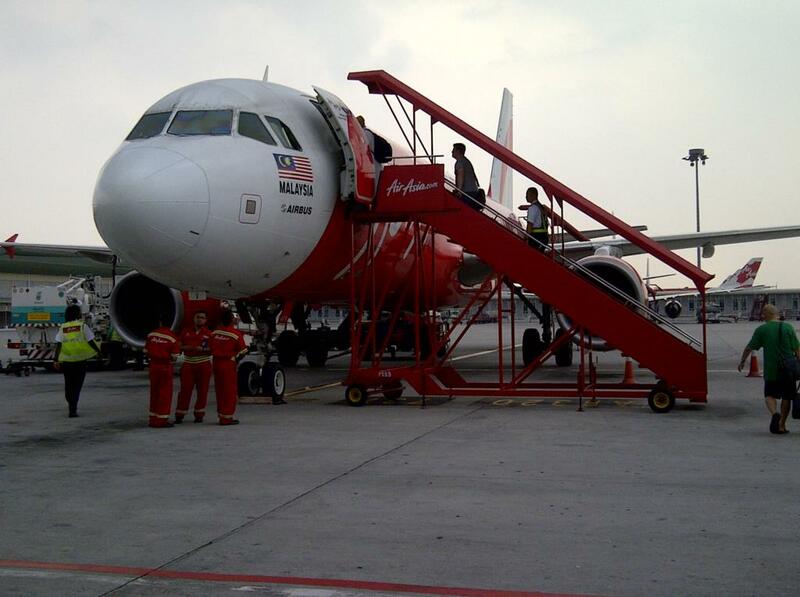 Although the A320 is a small jet aircraft, when standing at ground level it size seems anything but small. The crew of an adjacent aircraft finding time for a chat. 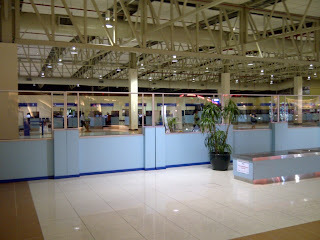 Photography in this part of the airport is forbidden so you have to be discrete and quick. I boarded the aircraft at 16:38 and owing to my regular seat being booked I was temporarily the man in seat 14a today. Most people found their seat quickly however there are always a few people who seem to be lost or only just realised that there are not sat with the partner because they didn’t pay extra to choose their seats. 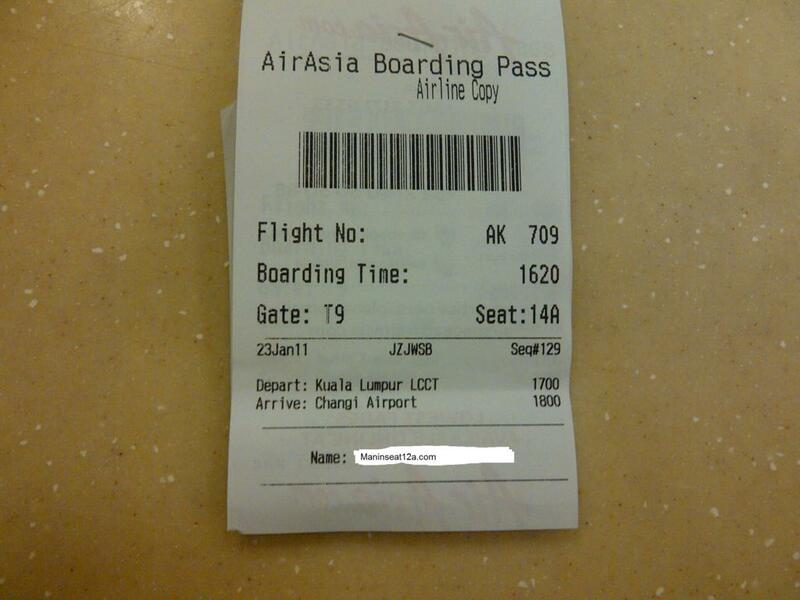 At 16:51 boarding was completed and the doors were closed a few minutes later. After a short taxi to runway 32R we departed at 17:03 heading north before making a u-turn back towards Singapore. Despite the flight duration being short I typically snooze, catch up reading magazines or listen to music. Owing to the journey being pretty short the relatively low cruising altitude of approx 22,000 ft is reached quickly and typically only a few minutes are spent at this level. 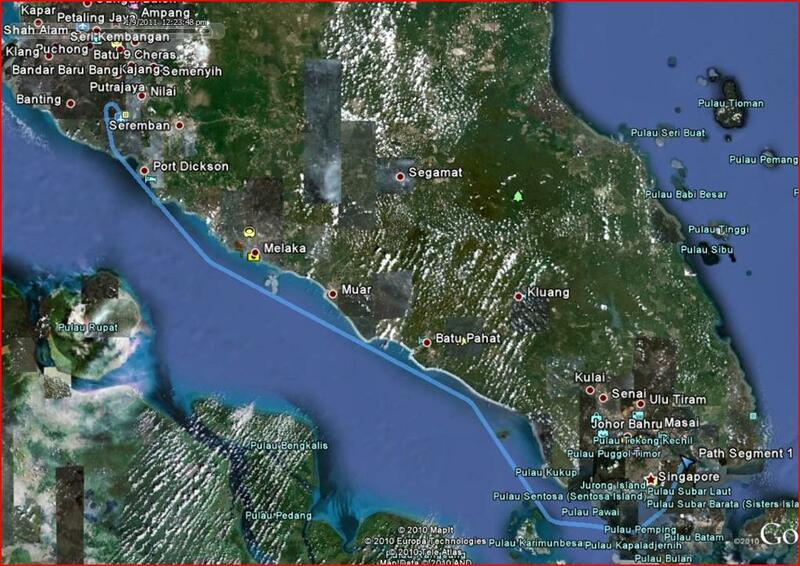 All too quickly at 17:23 it was time to start our descent as we passed the town of Batu Pahat. 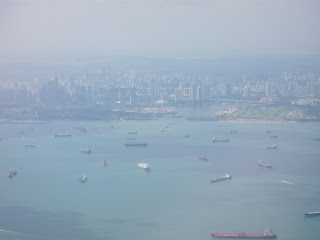 The decent was quite bumpy until we were below the clouds which is quite normal owing to the large amount of tropical storms that take place every day along the coast line. Due to the abundance of clouds photo opportunities were limited so I've added one from a recent Silk Air flight. 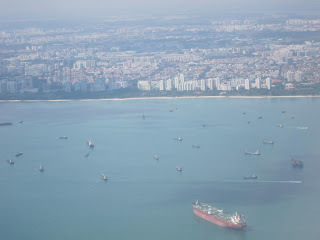 The pic below shows Pulau Kukup and if you look at the top right of the pic the coastline of Tuas (Singapore) is just visible. Today we were vectored around the south of Singapore over the Riau Islands of Indonesia and seemed to take a slightly more southerly route than usual. Due to some GPS issues the I've used sample track from a few weeks ago although the route was almost the exact same taken on this flight. 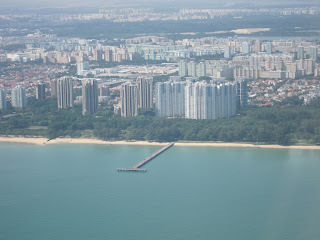 A landing from the south on the left runway at Changi provides fine views of East Coast Park and the sprawling condominiums dotted along the coast. 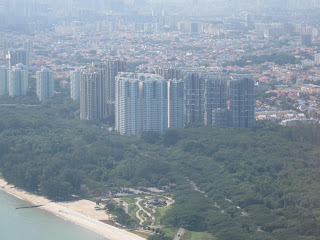 The pictures below were taken on a recent trip back to Singapore and start with a hazy Marina Bay and end with The Bayshore condominium (my old home). 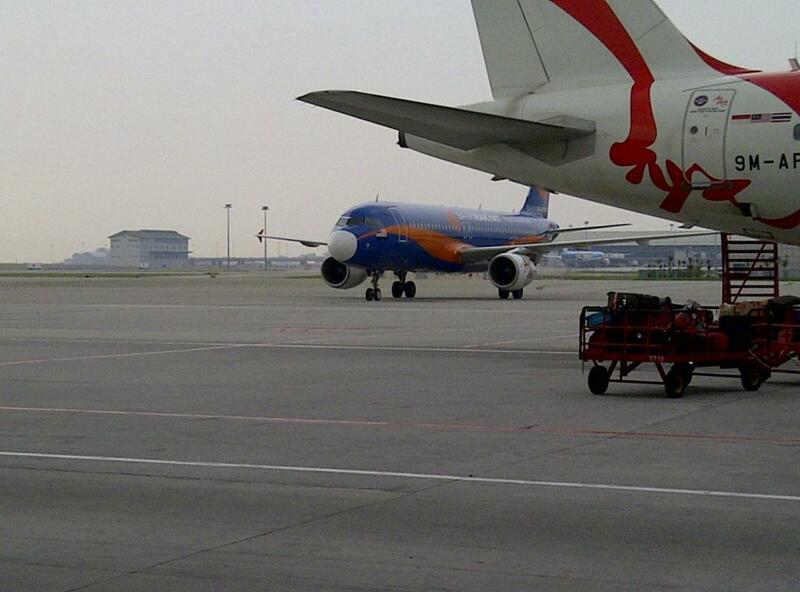 A smooth landing was performed at 17:43 and we arrived at T1's gate D37 a few minutes later. 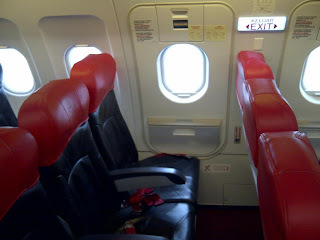 Disembarkation of a single aisle aircraft is never quick however from from row 14 it only took around 5 minutes. Terminal 1 is undergoing major renovations which also includes an extension to the retail area. As a result of this parts of the terminal are closed off with screens to hide the construction work. In T1,2 & 3 there are two immigration halls at each end of the terminal and a little tip to share is that if one is full then take a short walk to the other because it’s usually quieter. 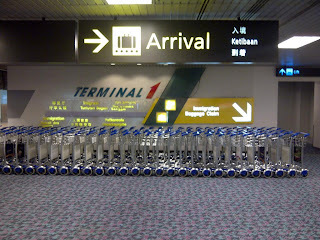 As a Singapore employment pass holder I’m able to use the ICAS system (Immigration Automated Clearance System ). This is a superb system that reads your passport/access card and then performs a fingerprint scan thus allowing me to clear immigration in less than 1 minute. Today I was travelling light with just some small hand baggage so a few minutes after leaving immigration I boarded a taxi at 18:00 reaching home at 18:23. The total journey time was 3:23 which is pretty good going and close to the best I’ve had which is about 3:15. I hope that this gives you a little insight into my regular rather tedious commute that I perform. So how do bloggers get people to their blog? Google? Referrals? Word of mouth? The press? All of these I guess. Whilst it’s important to have good content you need to actually get people there in the first place. The Man in Seat 12a is thinking about getting a t-shirt printed which will be used, you guessed it, when I travel in seat 12a on Air Asia, Tiger or other airlines. In the age of smartphones people can check the site instantly to see what it's about and I’m bound to get some strange looks from people but who cares. Will it work? probably and you only have to look at Tony Fernandes who is never seen without a hat displaying Air Asia or Team Lotus logos. 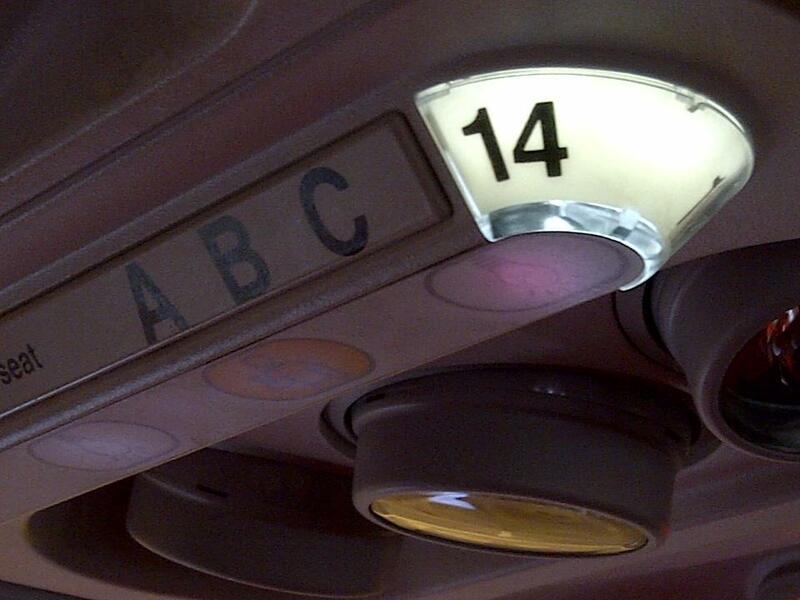 Look out for the Man In Seat 12a and don’t be afraid to say hello. Auntie: Ahh errr what you want ahh? 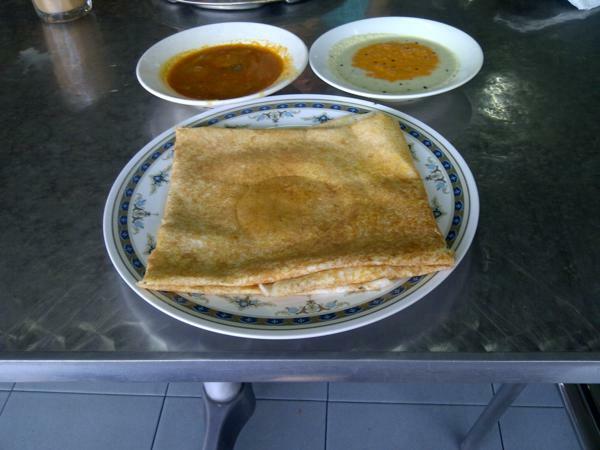 Me: give me roti prata & teh tarik please? Auntie: What lah? what is prata ahh? Me: getting frustrated, a plain roti pr-at-a with chicken curry please? Auntie: Ah what you want? 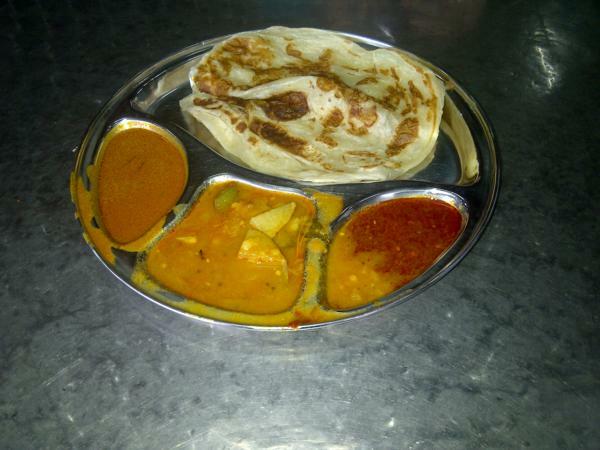 Prata err what lah? It was at that point that a fellow customer with a heavy Indian accent said at breakneck speed "he wants a roti prata"
Auntie: Oh par----art---aaa lah, sorry ahh, finished, not started yet! With that it was time to board the bus & 2.5 hrs later at Pagoh rest stop I enjoyed some nice roti telur washed down by a hot and tasty teh tarik. Still at least it wasn’t as crazy as the time in Bangsar I ordered a coke and got egg fried rice but that’s another story. 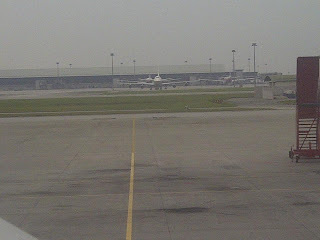 As a fairly seasoned traveller I tend to be on auto pilot when traversing the local airports here. On Sunday morning whilst travelling back from Jakarta to Singapore I encountered a situation that totally stumped me. 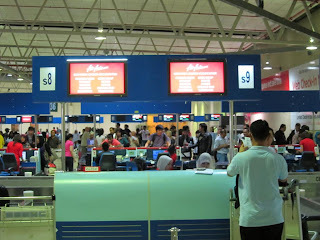 For those of you who have not been to Soekarno-Hatta airport before all the check in desks are laid out consecutively from 1-100+. As usual I entered the airport around half way point and found that Tiger airways were using desk 101. Its a fair walk to the end and after passing desk 98 the next few were closed and had no number. I continued to walk and ended upon the domestic section without any luck finding the Tiger airways check in crew. Walking back the other way musing to myself wondering if the previous night had affected more than I thought I still couldn’t find the desk. After walking back almost to where I started I gave in and asked for help. The kind Thai airways staff pointed me towards the start of the desks. Despite highlighting that my desk was at 101 and not number 1 they insisted it was correct. Sceptical and wondering if they were trying to inflict more pain on tired looking bule I forced quick smile followed by a terima kasih I carried on walking. After a few minutes I finally I found my desk #101. Is it a ploy to make people late so they miss their flights thus making more money for Tiger? I doubt it so help me here understand why some idiot designed the system like this? 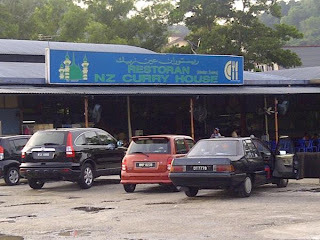 Malaysia has one of the most diverse cuisines mainly owing to its history, location on the former spice route and culinary influence from Thailand and Indonesia. Different places mean different things to people and this applies here to so when I ask different people about Malaysia they generally identify it with either food , the Petronas towers or the F1 race. Eating out and food is a national past time and way of life here as opposed to the UK where it's more of a luxury. 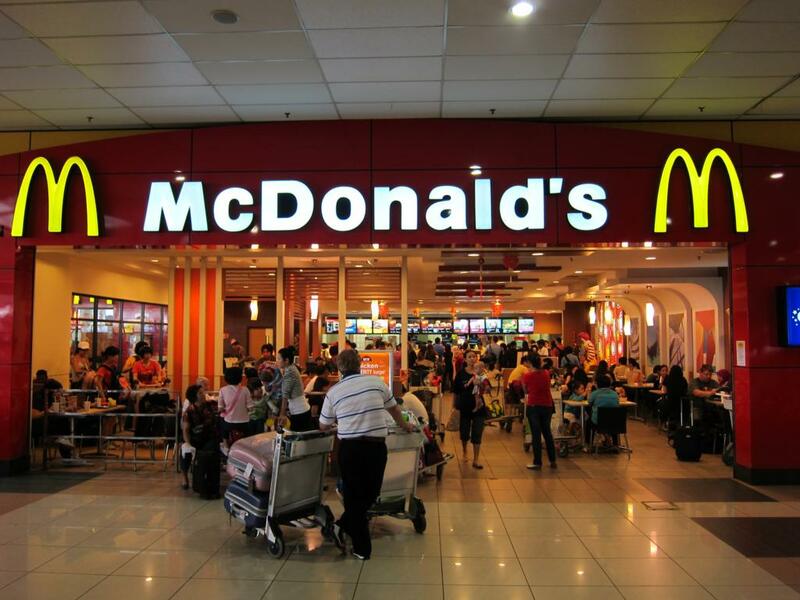 Having lived in Asia for the best part of a decade I've happily embraced this culture and when I'm back in Europe I find that after a few days I'm craving for my Malaysian delights and just want to get some quick cheap food. 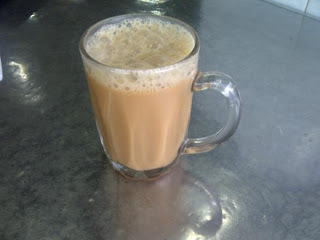 There are many places to eat in KL from street stalls to cafes to 5 star restaurants but for me my favourite place has to my local mamak restaurant where I can go for breakfast, lunch, dinner or supper. In KL there seems to be a restaurant or cafe every few hundred meters and my local area of Wangsa Maju is no exception. 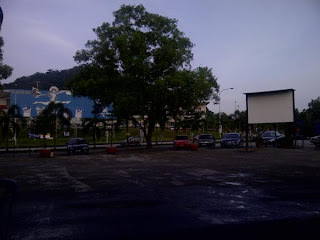 The giant restaurant NZ in Wangsa Maju is a real gem of a place with a car park, large outdoor seating at night area and EPL at weekends. At night time the place seems to come alive with the extra outdoor tables, EPL (football) and additional menu items such as satay and tandoori dishes which I'll blog on later. Today I'm a curry loving burger monster living in a tropical climate who is addicted to Facebook, starting to waste his time blogging and loves his BlackBerry. Isn't it funny how things can change!